Word of mouth is really the best advertising, especially when it comes to handmade quilts. A sweet client who is a friend of a friend of a friend approached me recently to ask about a quilt for her toddler. She had seen a quilt that I'd made for a friend of hers (this one, actually), and loved it; she'd always wanted a quilt for her daughter but hadn't known who to ask until she found out that I do custom quilts. She had a really good idea of what she was looking for. 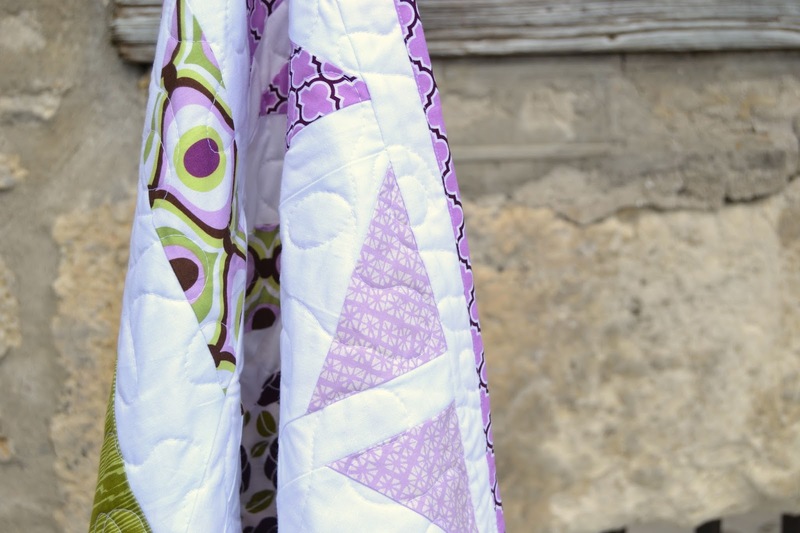 In fact, she already had this picture of an adorable baby quilt made by Jess of Craftiness Is Not Optional, which she loved. We brainstormed a bit about different patterns that I could do that were similar, but in the end we decided to stick pretty true to her original inspiration*. *I did however use a different method for piecing than used for the inspiration quilt. I strip-pieced in sections and cut strips diagonally, then flipped and rearranged in sections until I found a layout that worked. Sort of like this tutorial. I took a few photos along the way, so I'll post more about how I did it once I get around to it. My client requested the colour scheme based on the colours in her daughter's bedroom, and I searched high and low for purple and green fabrics that fit the bill and looked good together. The fabric hunt was harder than I anticipated. Purples are funny - even though I'm really drawn to shades of purple (especially lavender), I don't actually sew with them a lot, because I find that they can be really tricky to mix and match (well) with other colours. Which is especially ironic given that, as Fancy Nancy tells us, lavender goes well with almost anything (Anybody? No? ...Maybe I'm the only one whose reading material consists mainly of toddler lit...). I ended up going with fabrics from Joel Dewberry's classic and lovely Aviary 2 collection, as well as Feeling Groovy by Michael Miller, two older fabric collections which I managed to track down at Hawthorne Threads in the U.S. I added in some Kona Lilac and a lavender/lilac blender from Moda that I had on hand in my stash. All mixed together on a crisp background of Kona White, I think the colours are fresh and cool and girly without being too girly - I absolutely love it. I backed it with some herringbone pieces left over from piecing the front, and a big piece of Joel Dewberry print, along with more Kona White. I even managed to sneak the name of the quilt's recipient into the quilting. I hope she gets years and years of cuddles under her very own quilt. 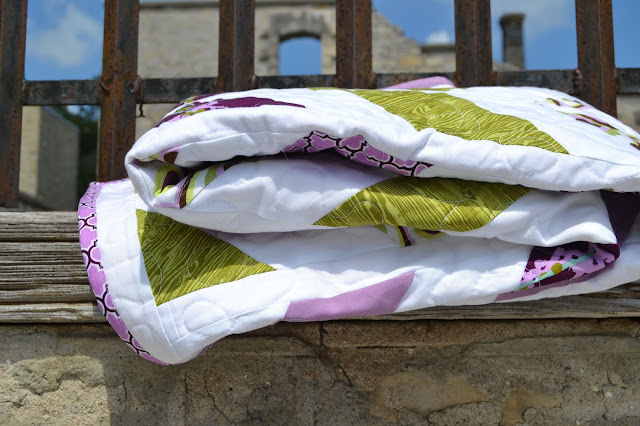 We (me, my husband, kids, dog, and quilt) took advantage of the hot, sunny weather to take a walk down to some old mill ruins near our house here in Guelph and photograph the quilt in the wild. Lots of #quiltswithfeet (look up that hashtag on Instagram, it's hilarious) but no #husbandsholdingquilts this time (another one that I get a huge kick out of)... I did the honours myself while two kids screamed in the Chariot jogging stroller that they wanted to "Seeeeeeee the quillllllllt!" and "She's eating my cheeeeeeeesestrinnnnnngggg!" Don't these photos look idyllic? Good thing there's no audio on blog photos. Ha. This one's a keeper, and even though it's a colour scheme that I don't think I would have chosen on my own, I love it. 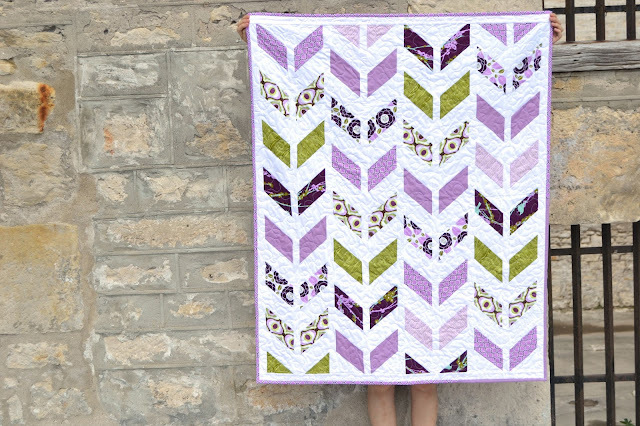 I actually have a few more herringbone scraps left over here that I'm planning to use to make a scrappy sampler quilt with similar colours... so I don't think I'm done with purple and green yet.